One memorable U.S. experience noted by many of our former Career Training USA participants is enjoying brunch! This late morning or early afternoon meal is a staple in the U.S., especially on the weekends. It combines the best of breakfast, lunch, and cocktails into one leisurely meal. Brunch is served at restaurants throughout the country, but in New York City, it is particularly beloved. By eliminating the need to get up early on Sunday, brunch would make life brighter for Saturday-night carousers. It would promote human happiness in other ways as well. Brunch is cheerful, sociable and inciting. It is talk-compelling. It puts you in a good temper, it makes you satisfied with yourself and your fellow beings, it sweeps away the worries and cobwebs of the week. Although written over 100 years ago, this sentiment still resonates with brunch today! It is a leisurely and social meal that is often enjoyed the morning after a late night out on the town. Brunch first became popular in the U.S. in the 1930s in Chicago. As a transfer station for cross-continental trains, people would stop in Chicago for a late-morning meal. Allegedly, Hollywood stars would dine in high end Chicago hotels during their layovers, since many restaurants were closed on Sundays. However, it is New York City that really took charge of the brunch trend. New Yorkers are obsessed with weekend brunches, and restaurants are constantly trying to offer the best brunch in the city. Because it combines breakfast and lunch foods, brunch fare tends to be varied and eclectic. Traditionally, you will find basic breakfast staples like omelets, frittatas, pancakes and waffles. Yet at the same time, menus will boast lunch items like sandwiches, soups and salads. 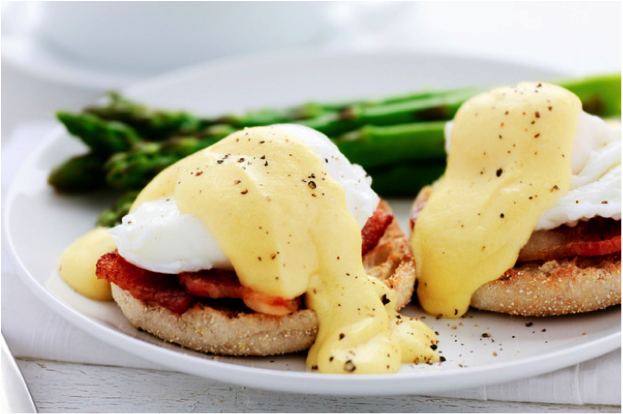 One of the most iconic brunch dishes is eggs Benedict. A simple combination of poached eggs and Canadian bacon atop an English muffin covered with Hollandaise sauce, it is a favorite of brunch goers across the U.S. There are two competing stories for how this dish was created, but both indicate the meal originated in New York City. One account says that eggs Benedict was invented in the 1890s at Delmonico's Restaurant. Apparently a diner named Mrs. LeGrand Benedict did not see anything on the menu she liked and requested that the chef, Charles Ranhofer, create something original for her to eat. Another story suggests that the dish should be credited to Mr. Lemuel Benedict, who, while dining at the Waldorf-Astorial in 1894, requested eggs, bacon, toast and a small pitcher of hollandaise to help treat a hangover. Whatever the truth may be, eggs Benedict has remained a beloved brunch item ever since. Over the years, chefs have become much more adventurous with their brunch menus. It helps that brunch has no set rules and restaurants can combine any number of breakfast and lunch dishes. Brunch goers like to be pampered and take a leisurely time with their meal, and many dishes tend to be rich and decadent. Stuffed French toast, chocolate chip pancakes, and steak and eggs all are favorites. There are also many restaurants now that serve different ethnic fare for brunch, such as Mexican huevos rancheros. Dim sum has also become a popular trend for brunch in recent years. Whatever your preferred dish, you are sure to find something you like on any brunch menu! We hope that you will have a chance to have some delicious brunches while in the U.S.! 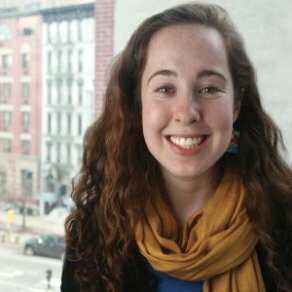 A Pennsylvania native, Sarah Wadlinger has a B.A. in International Studies and served as the Participant Services Coordinator for InterExchange Career Training USA from 2011 to 2013.